When I worked in a survey firm, I was tasked with building a VOIP system to cut costs and to raise productivity. The biggest productivity drain in an outbound call center is the dialing time and getting someone on the line. By implementing an Asterisk server, we could control and expand the server to our needs. Furthermore, this meant we could have remote workers. We saved a bundle of money in long distance and in fixed costs. The hosted server and the bandwidth itself cost about 80$ a month, while the connectivity to the phone network was negligible and, more importantly, flexible. In other words, if it was a slow month, the cost was low, and conversely, if it was a very busy month, the costs were higher but the money was coming in. Since it was my server and I was billing the company for it, I figured I could use the same server for my personal phones. So I decided to connect my PSTN numbers to this system. 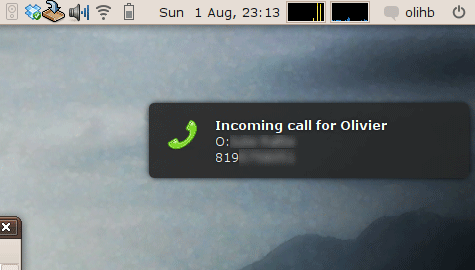 I could now use the server as my private VOIP server. After configuring the VOIP server to my liking, I started to explore the Asterisk API and related Java and Python bindings. My first module was an interactive IVR system to manage callbacks from the survey outbound number. The callers could know who called them and remove their number from our calling lists. 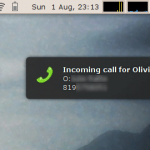 After installing the two preceding modules and lauching the following script, it will pop up a notification window each time you get a call. The configuration options are self-explanatory. The Asterisk Manager Interface and its firewall should be configured to allow access from the computer running the script. By adding the script in the startup application control panel, the script will launch at logon. I’m not sure why this wouldn’t work on Unity. Perhaps if you can let me know the errors you got I could make some suggestions, but I don’t have unity available myself. As far as I understand Unity includes Notify OSD, with which pynotify works. I agree. I wrote that script a long time ago. It doesn’t work anymore on my ubuntu 11.04 machine. When I’ll have more time, I’ll try to investigate what’s going on.